Well, shiver me timbers! Philip Yates and Sebastia Serra are bringing Christmas to the pirate's ship. "Twas the night before Christmas aboard the Black Sark. Not a creature was stirrin', not even a shark! 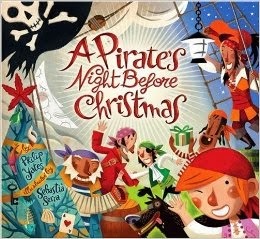 This adventurous twist on the classic, complete with pirate glossary, is perfect for the holidays! On this night before Christmas, a red-headed little boy and his disheveled dog are on the lookout for Sir Peggedy (a pirate's version of Santa Claus). Amidst the fog, they spot him and his eight seahorses. Looking a little menacing, the boy soon realizes that Sir Peg has brought gifts for the pirates in the form of coins and shiny gifts. Briefly forgotten, the boy is saddened by his lack of gift because he wants what every little pirate boy would want: a map to a treasure chest. Yates's use of classic rhyme combined with pirate slang is an enlivening take on Clement C. Moore's tale, and Serra's illustrations are bold, bright, and exaggerated enough to illustrate a merry band of pirates on the Black Sark. Sometimes a classic just needs a update to keep it fresh, and this pirate tale will have you looking for an eye patch and a little adventure.